Yesterday I went to church by myself. Jason has been sick and both kids were a bit booger faced. It was so nice to be able to sit and listen to the speakers. One of the talks got me thinking.........He was telling about how the temple is the best place to feel the Holy Ghost. 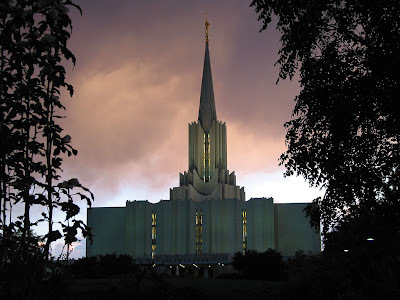 He told about the first time he went through the temple. He said he was so nervous and anxious. He wondered how people could say the first time was so spiritual, when you have to worry about doing everything right and so on. Then he told about the going into the celestial room and the feeling he felt in there, how strong the Spirit was in there. He talked about his beautiful wife in white and how happy and young she looked, it was so sweet. What does this have to do with me? I started thinking of my first time through, lots of things come to mind, but the thing that got me while listening to Bro. Clayburn was how Happy I was to see My family (parents, and grandparents) All dressed in white, smiling at me, the one person who stands out the most Is my Grandpa Huddleston. He looked so clean, and ..............happy and good! I am glad I was able to have that experience and have that memory of him. There is nothing like being in such a holy place with your family! I copied and pasted this from my cousin Erica's blog, please copy and paste to yours as well, lets spread the word! I plan on running, but I need some friends or sisters to do it with me! My cousin has a friend Carrie butler who has done our family photos and her brother is Brett Fafard. Brett was diagnosed with STAGE 3 testicular cancer in June of last year. He has since undergone surgery and six rounds of chemotherapy. Unfortunately this fall, his doctor found residual cancer and has decided that the next step is salvage chemotherapy, which will come in the form of back to back bone marrow transplants. His doctor has said that while he has a negligible chance of beating the cancer without these transplants, his chances increase to 70% if he has the transplants. While Brett was very blessed to learn that he was approved for a primary insurance with medicaid as a backup, his primary insurance company has denied the first request for the procedure. Medicaid has agreed to move forward with the first transplant but is declining to provide the second. While one transplant is better then none, the Doctor feels that in order for Brett to be cancer free and return to leading a healthy life that he must have both transplants. Carrie and her husband, Mike have been doing everything they can to help Brett with all of his medical expenses. But the fact of the matter is, they have a family of their own to take care of and they simply cannot come up with this money all by themselves and in the short amount of time they have left until Brett needs his second transplant. If they could get 120,000 people to donate a dollar, then they will have made their goal!! Carrie is organizing a "Fafard 5k" to help raise money for Brett. It will take place on February 27th at the Riverwoods in Provo. It is $20.00 a person. I know a lot of you out there are runners or else know of people who are so please join us in this race! It is for such a good cause. Dahlia playing with Amy's dog Mac. Dally is so brave, Mac does like kids! he is getting better though, now that Amy has moved back home with my parents he gets to be around the kids more! yeah for us not so yeah for Mac. the kids love him though especially Dahlia despite his impatience for them. Grandma Julee doing the Jumbo Dinosaur puzzle Mickey got from Grandma and Grandpa, oh and that is his new soccer ball Grandpa gave him, not that he was playing with it, I think he was a bit pissed that he got it. Grandpa and Dally playing barbies and doll house, Grandpa loves to play with Dally! opening gifts, notice our laundry hamper with the garbage bag in it to collect all the wrapping paper! funny. Mickey opening his soccer ball, cones and shin guards that he LOVED, he just pulled them out one by one and through them behind him. what a brat! I felt bad, I bet my dad was really excited about giving him those, but mickey just isn't really into sports at all! he like gets mad when anyone talks to him about playing sports. oh brother! Mickey and Dahlia in their new P.J's from Grandma Torg, I forgot how to upload the pics, so they are in the opposite order that i meant them to be. I wanted them in order of how they happened, but thye are opposite, the next pics are just a few things we were busy doing in the month of December. The Christmas sugar cookies of course,(bells, trees, stockings and gingerbread people) but this time I did them by myself, so I could do whatever I wanted and I really enjoyed it even if it did take all day! Took the kids to the south town mall to see Santa, because he looks the most real, but he was kind of ornery and not very fun..........boo to you Santa. right after this someone told me the best way for your kids to get the swine flu or any other illness, is to take them and sit them on Santa's lap! would have been nice to know before hand, although I am pretty sure we would still have taken them, just would have been more germ cautious. but they didn't get sick thank goodness!